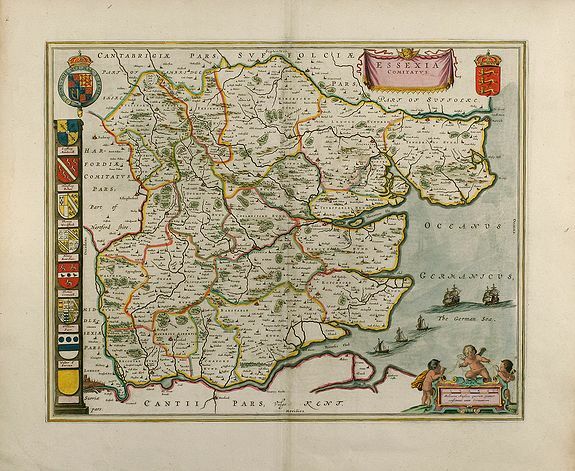 Essexia Comitatus - Blaeu, W.J. Map maker : Blaeu, W.J.. Size : 16.5 x 20.7 inches. / 41.9 x 52.6 cm. Description :Outstanding attractive map of the country of Essex in UK. Showing London in the lower left corner. Colour is gold heightened, with king coats of arms and family coats of arms, last is empty. French text on verso, with a coloured view on back. Condition : Minor crease in lower margin, wide margin and heavy paper, extraordinary fine example of this attractive map.